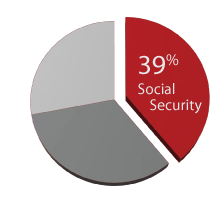 Your Highest Priority Regarding Social Security is to Maximize your Social Security Payments for Life! There are 567 ways to claim – which way is right for you? If you make the wrong choice, you could miss out on as much as $250,000. Many make mistakes when claiming Social Security that can reduce their benefits by as much as 76%. Social Security Administration Policy prohibits employees from giving you advice for filing your claim. Even if you have already begun collecting your Social Security Retirement Benefits, there may be strategies available to you that could substantially increase you future payments. For some reason, many people don’t think of Social Security as part of their financial resources or as something that requires planning. The fact is, if you’re like most people, Social Security will represent 39% percent of your retirement income – or at least it can if you maximize it. The Tax and Financial Strategies team took the time to become experts on Social Security issues so that we can help our clients maximize their Social Security resources as part of their complete retirement portfolios. We are ready to assist you in assembling the best possible plan for you and your loved ones.